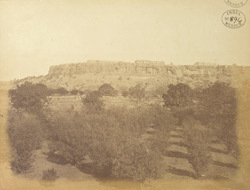 The great Fort of Gwalior stands on a rocky sandstone hill reached by a steep road. The hill is about 2.8 km long and varies in width from 183 to 853 metres. It was defined by the Mughal Emperor Babur as 'the pearl amongst the fortresses of Hind' because of its glorious history. During a period of 1000 years many rulers, including the Tomars, the Mughals, the Marathas and the British annexed the fort. In the early 19th century the fort was ceded to Scindia by the British in exchange for Jhansi. Within the fort there are several palaces and temples and many water tanks. Encircling the northern end of the fort on the plain below is the old city, whilst the new city of Lashkar lies about a mile to the south.